My Coleman has moved back home from Arizona, to be with the love of his life. When I say home, I mean within the state of Wisconsin. Anytime you can travel a couple of hours to see your kids, “they are home”. Upon arriving back, the first thing this child did, was get down on one knee and propose to his college sweetheart. Now, I guess that means that sometime (no date yet) down the road I will be a “mother-in-law”, since she said YES. How fortunate I am to have Heather be part of our family! And I’m hoping she feels the same. I love you both; Coleman -n- Heather! It’s late, and I cannot sleep. Lots of stuff going through my mind as orders are starting to come in, and I’m very excited about that. In addition to keeping up with our orders, I am trying to do our wedding announcements. One month after our wedding, is my nieces wedding (huge catholic wedding) which I have had the honor of taking on the responsibility of her announcements, programs, etc. This is the time of year I have been waiting for, and our business appears to be taking off. I would like nothing better than to quit my job and work JillCards, LLC full-time. It is a creative aspect of my life which gives me a lot of serenity, and peace. We had a visitor today, and it was so exciting to see Ana again. Ana is a younger friend which we met through our recovery program. She has since moved on to participate in the rest of her life IN RECOVERY in another state, and I must say that she looks great. She seems to be at peace with herself and doing the best she can in this mixed up and crazy world. Way to go Ana….Good things come to those who do the “next right thing”. Last weekend we traveled to Minnesota for a “girls getaway”. It was a fantastic weekend with good food and great company. We all did a lot of laughing, and we went away full, happy and content! We really should do that at least once every 6-months, as sort of soul a cleansing and renewing. I hope everyone is doing well (and sleeping) and are healthy & fit. This weekend will be a “girl’s weekend” with a few friends, that are the “best”. It has been a needed mini-vacation, as I appear to be slacking in the wedding prep department, and I tend to have blinders on most of the time. It seems that when I get my brain on something, I cannot entertain anything else, until I have my projects completed. 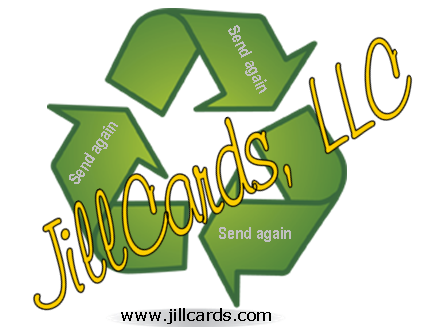 With JillCards, it doesn’t get completed, because I continually get orders and have holidays and occasions arise. Now, I’m not complaining, because that is a good sign, but everything else in my life gets put on the back burner. I have been reminded that I have a wedding to attend in May of this year. Since I will be one of the brides (Mrs & Mrs), I guess I need to do more than just attend. I am a person who waits till the last-minute, but I have grudgingly admitted and confessed last night that this is not one of the occasions that I can wait till the last-minute for, and still pull it off. Okay, okay! I am turning over a new leaf (haven’t heard that one before!) and putting everything else on the back burner, until I have equally done my part for this wonderful wedding; even though Dee Dee is at the point of more than half way over the line of her equal part. Last night I made some DEMO wedding announcements, for opinions and feedback. That leads me to this get-away weekend with the best of the best. I am hoping to have a final decision on “the one”, and starting next week, I can get a good start on the bulk of the invitations. I’m really hoping to get a lot of the things we need for the ceremony, reception and dance! Most of this event will be a hand-made/home-made adventure, and since I have confessed my lack of attention to this event, I feel much better and relieved now to get it going. The hardest part for me is the confession of my character defects. The only problem I have is that most of the time I do not even see my character defects until it’s right there staring me in the face, and taking on a life of its own. Wish me luck in the wedding prep department, and have a good weekend. I know I will with “the girls”!